The popularity of investing in American railroads at the Amsterdam exchange is shown in this 1910 map of the Amsterdamsch Fondsenkantoor (Amsterdam Fund Office). 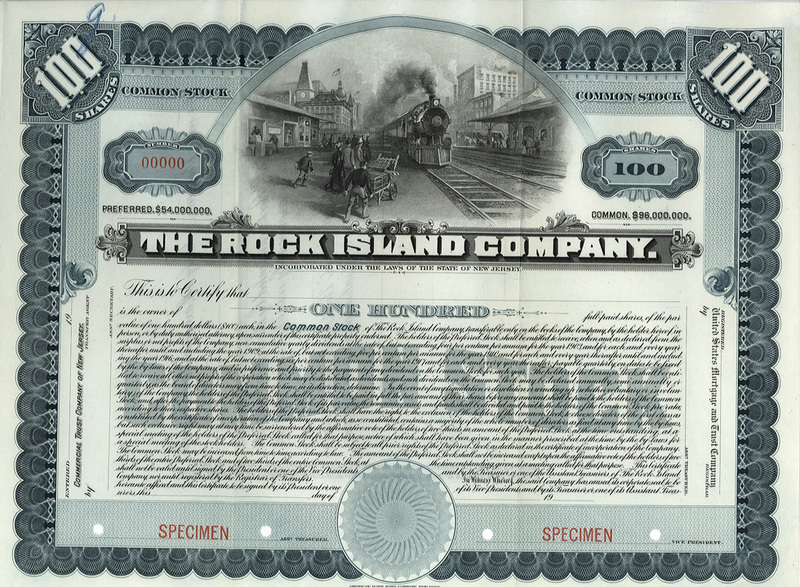 The Rock Island Company was one of the many American railroad funds that were listed in Amsterdam. Railroads enjoyed the trust the internet has today. Especially in the beginning, investments were often highly speculative in nature for that very reason. 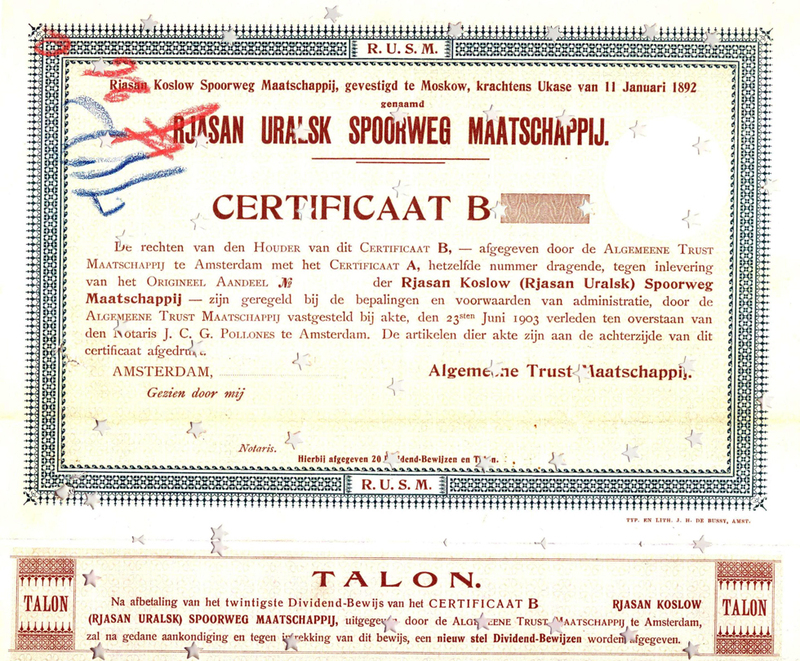 Foreign railroads, such as the Russian Rjasan Uralsk Railroad Company, usually only had certificates listed on the Amsterdam exchange. An advantage of this was that dividend payments could easily be settled by local securities firms. The oldest railroad company in the Netherlands, the Hollandsche IJzeren Spoorweg-Maatschappij (1837), one of the predecessors of the Nederlandse Spoorwegen, also regularly used the Amsterdam exchange for its capital requirements. Especially after the end of the US Civil War in 1865, investing in American railroad funds became popular. Europe was in the grip of international tensions and investors were looking for a more stable investment market. Moreover, the number of Dutch funds on the stock exchange was still limited. The return on US investments was attractive: 6 to 8%, and, in addition, a good chance of profiting from price gains. The first American railroad fund appeared on the Amsterdam stock exchange as soon as 1856: bond loans issued by the Illinois Central Railroad. The next railroad company was the Galverston, Houston, and Henderson Railroad. The railway was never completed, and the company only made one payment of interest. When the company was sold in 1871, it did not yield enough money to pay back the bond holders. Despite the frequent lack of solidity, railroad funds remained popular. 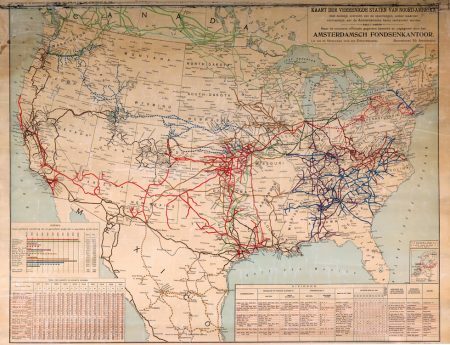 In the early 20th century, over one hundred American railroad funds (‘Amerikaantjes’) were listed. Hence, they constituted the largest group of funds on the Amsterdam stock exchange at that time. As of mid-19th century, several dozens of Russian railways were listed as well. Initially, this was arranged by trading firms Hope & Co and W. Borski, both of which had always had many contacts in Russia. Later on, securities firms such as Lippmann Rosenthal and Wertheim and Gompertz arranged various Russian railroad issuances in Amsterdam. Some of the striking names were the Moskou-Kiew-Woronesch and the Losowo-Sebastopol Railway Company. The average return on Russian railroads was 5% at most. Unlike the ‘Amerikaantjes’ Russian bonds and shares were considered as low-risk, because they were guaranteed by the Russian state. This remained unchanged until the Russian Revolution of 1917 threw a spanner in the works, and the new Bolshevik regime declared all Russian securities invalid. On a side note, the first private Dutch railroad companies benefited from the public capital market in the 19th century as well. 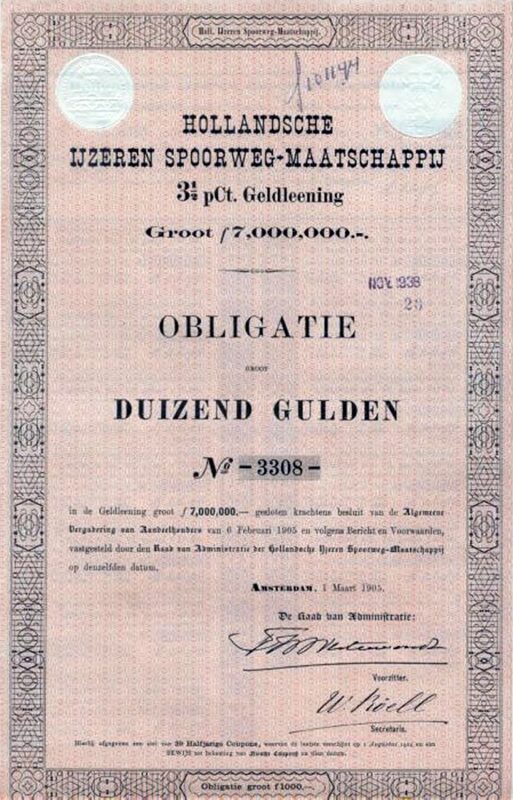 The Hollandsche IJzeren-Spoorweg-Maatschappij placed several loans on the Amsterdam stock market, as did the Nederlandsche Rhijn-Spoorweg-Maatschappij.